It’s a fake … I know, and it’s time to get over it. Sure, you can say Ding Tai Fung is deceptive by adding a “g” in their title, which allows them to sound like the Taiwanese conglomerate without using their actual name. 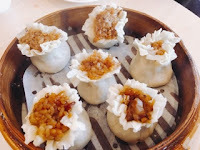 But, if the massive soup filled dumpling powerhouse doesn’t care about this little known Markham outpost, why should we? 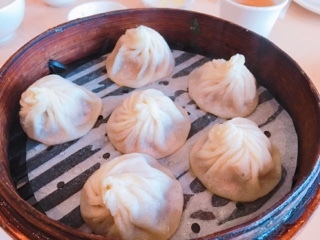 Especially since the restaurant does make a mean xiao long bao ($6.25); you can see the men standing around the table filling and pinching these pillows of joy. Interestingly, upon closer inspection, they actually look larger before being steamed. How the ultra-thin wrappers holds all the broth and can withstand being pinched by chopsticks is still a small miracle. 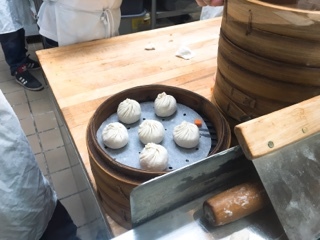 As soon as the lid is lifted I can’t wait to get my hands on these succulent pork dumplings. 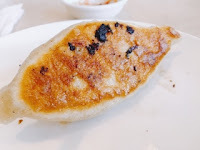 Why we’ve never ordered the Shanghai wonton with spicy sauce ($7.49) until this visit is beyond me. 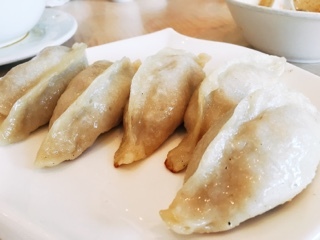 There’s nothing fancy about the bite-sized pork wontons but the salty soy laced with chili oil and tart vinegar pairs so nicely. The pan fried pork dumplings ($6.49) continues to impress with its crisp bottom and equally juicy filling. I could happily go through an order of these myself. 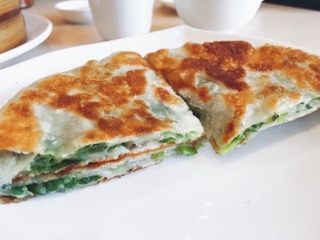 And I’m glad Ding Tai Fung doesn’t skimp on the scallions used in their green onion pancake ($3.99) – pan fried slowly (rather than deep fried) following the traditional recipe. 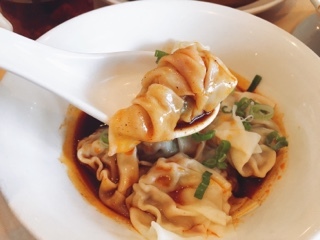 Grab a helping hand if you plan on sharing the braised beef noodles in soup ($8.99), the chewy doughy noodles impossibly long to land into a smaller bowl without some splashing. 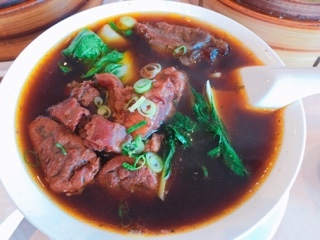 The soy sauce and beef stock broth is decent and there were plenty of pieces of not overly fatty meat to go around. 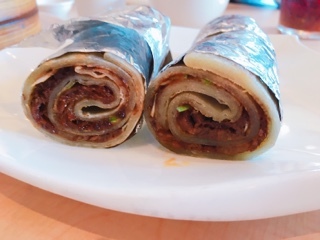 There were two passable dishes: the wrap used in the stewed beef pancake ($6.99) way too thick, giving the dish an overly doughy consistency detracting from the beef. Also, the sticky rice and pork siu mai ($6.49), pretty to look at but lacking any real flavours. 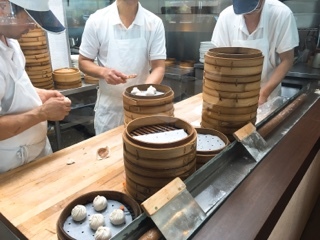 After a satisfying meal, do you still feel a little bad about Ding Tai Fung not paying its fair share of royalties? I can get over it. After all, they do have that “g” in their name … and for me it stands for great.